Broadway and film actress Barbara Harris was born July 25, 1935 in Evanston, Illinois and began acting on stage as a teenager in Chicago at the Playwrights Theatre alongside Edward Asner, Elaine May and Mike Nichols in the early 1950's. The Playwrights Theatre had been co-founded by director Paul Silverberg (Paul Sills), who went on to co-found an improv group called The Compass Players a few years later, in 1955. 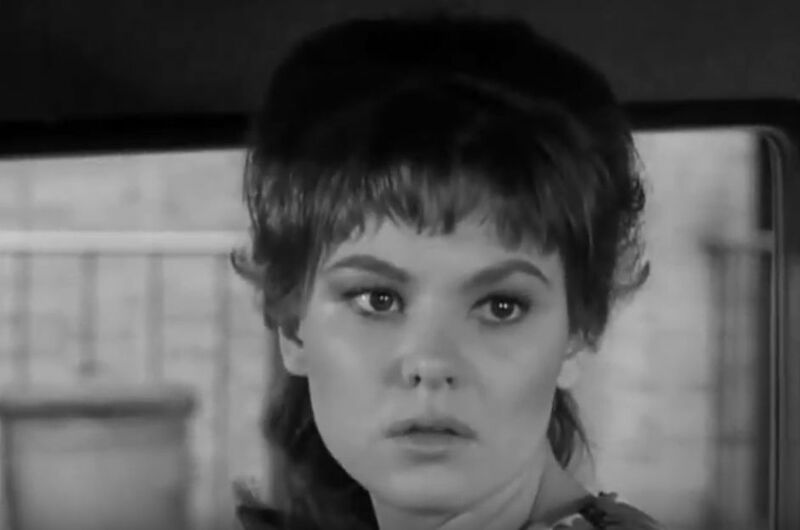 Below, the cinematographer, director, and actress Barbara Harris have perfectly captured her dewey good looks and innocent yet startled fawn expression. Barbara Harris and Paul Sills married, and Harris remained a member of The Compass Players, the first American improvisation group, until it ended in the late 1950's. Barbara Harris and Paul Sills divorced in 1959; even though they were divorced, Sills cast Harris in a new improv group he'd just founded in Chicago called The Second City. Harris was nominated for a Tony Award for Outstanding Featured Actress, for her sketch performances in the 1961 Broadway edition of From The Second City. Below, Dan Duryea and Barbara Harris played father and daughter in a 1962 episode of Naked City "Daughter Am I in My Father's House". Harris is a teenaged girl who is harassed by some boys at the movies, and her father plans to get justice/revenge for her. The short clip below is an intense scene demonstrating how the father's efforts to extract revenge for his daughter are another kind of abuse of her. Barbara Harris does a great job of portraying a nervous, doe-eyed teenager (above screenshot), although at the time she was in hr late 20's. Although Barbara Harris nabbed some guest star appearances on television series, from 1961-1970 she focused on her Broadway stage career, appearing in 6 major plays and musicals. Barbara appeared in Mother Courage (1963) with Anne Bancroft, and got her first Tony Award for Best Actress in a Musical for her role as Daisy Gamble in the new play On A Clear Day You Can See Forever (1965), a role written for her by Alan Lerner and Burton Lane, who had seen her in From The Second City. Her role in the musical The Apple Tree (1966-1967) was also created for her, by Jerry Bock and Sheldon Harnick; Harris starred opposite Alan Alda and was directed by Mike Nicols, whom she knew from their Chicago Playwrights Theatre days. Barbara won another Tony Award as Best Actress in a Musical for her role as Eve in The Diary of Adam and Eve (1967). A Thousand Clowns (1965) was Barbara Harris' movie debut, opposite Jason Robards; they were both nominated for Golden Globe Awards for their performances. More movie roles followed for Barbara Harris as she curtailed her stage career in the early 70's, including 1971's Plaza Suite opposite Walter Matthau, and Who Is Harry Kellerman and Why Is He Saying Those Terrible Things About Me? with Dustin Hoffman, for which she was nominated for an Academy Award for Best Supporting Actress. Below, Walter Matthau and Barbara Harris are featured in a movie clip from Plaza Suite. Her most well-known movies and roles came in the mid-1970's, beginning as Albuquerque in Nashville (1975) opposite Ned Beatty, Keith Carradine and Lily Tomlin (among others). This was followed by the role of Blanche Tyler in Alfred Hitchcock's dark comedy Family Plot, co-starring Bruce Dern, Karen Black, Ed Lauter, and William Devane. In Freaky Friday, she was Ellen Andrews, opposite young co-star Jodie Foster. She was nominated for a Best Actress Golden Globe Award in all 3 movies. Below, the movie trailer for Family Plot features Barbara Harris, Bruce Dern, William Devane, Karen Black, and Ed Lauter. She continued to act periodically in movies during the 1980's; in her age 50+ years, appearing as Kathleen Turner's mother in 1986's Peggy Sue Got Married; after a smaller role in 1988's Dirty Rotten Scoundrels, she took a 9 year break from films before appearing in her final movie role in Grosse Pointe Blank (1997). "I haven't worked in a long time as an actor. I don't miss it. I think the only thing that drew me to acting in the first place was the group of people I was working with: Ed Asner, Paul Sills, Mike Nichols, Elaine May. And all I really wanted to do back then was rehearsal. I was in it for the process". Although she guest starred in a radio audio show Anne Manx on Amazonia (it was turned into an audiobook) in 2005, Harris has consistently shunned the limelight and kept her private life very private. She was still residing in Scottsdale, Arizona as of 2013 and was fully retired, no longer giving acting lessons. Did You Have a 'Brownie' Camera? Barbara Harris might be my biological mother. I can't disprove it yet. If anyone knows how to contact her, I'd greatly appreciate it. What a lovely woman. Loved her in Peggy Sue Got Married.